Pros: Customer support is great! I had a couple of problems integrating BookSteam into my web site, and customer support worked with me until it was fixed. 3) the ability to find a class once it has been cancelled from the schedule - Beware! If you cancel a class and have it display as cancelled on your public calendar, it is there forever. There is no way to remove it. 4) having all classes show on the public calendar. Currently only classes that can be booked online can be displayed. If you have a class that you do not want to be booked online, you cannot display it on the calendar. Therefore, I have had to use a Google calendar in addition to the BookSteam calendar, so customers can see the full array of classes offered. Overall: BookSteam's lack of frills and options is redeemed by its low cost and really stellar customer service. Overall, I am pleased with the software. 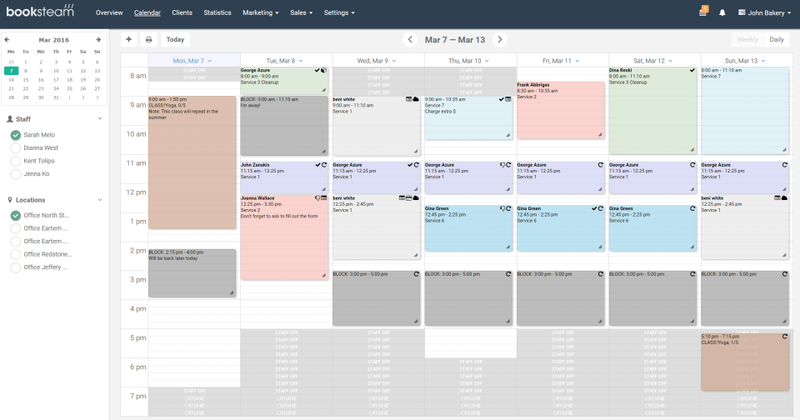 Pros: The smart scheduling option where booksteam calculates online appointment start times automatically. This saves money and keeps my massage therapists booked, making the most use of their time! Cons: Text reminder doesn't have options to customize. I've had clients try to reply to the text to cancel, and that doesn't work. I cannot find a place to process customer receipt or printing a list of their past appointments. This would be helpful for submitting documentation for flexible spending or health savings accounts. Even though the e-mail option works very quickly when there is a customer service issue, I still miss the person to person contact of a phone call. But, my issue was resolved within minutes of sending, so I guess this system works. Overall: I love that I do not need to be by a phone to make business happen. I'm spending my time giving massages and running reports, not scheduling. My clients think the site is really easy too. Pros: There is a lot of software that does appointment booking or class booking and a few that do both, but when I looked at the ones that do both something always didn't work the way I needed it to... Until I found Booksteam. The versatility and range of options have really allowed me to set everything up just as I need it and the cost is lower than most of the competition too. I've had to contact support a few times and they've always been super helpful and quick to respond. They've also be receptive to my development suggestions. Overall I've been very happy that I went with Booksteam. Cons: Sometimes I find myself a bit confused by all the options, but I guess that's the price of having such great adaptability, and since the support is so good, this isn't really a problem. Booksteam is the BEST scheduling software out there! We tried two others but third time's a charm. Pros: Booksteam is so versatile - customers can search by location, practitioner, class type, etc. And the reports it generates are very helpful in terms of tracking attendance, no-shows, and seeing trends develop over time. Also, I have to give a shout-out to customer support which is second to none. 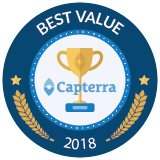 We had a LOT of questions when setting up the system, and I can honestly say there was not a single time they did not reply quickly and concisely (usually within a 2-hour window; sometimes as quickly as 5 minutes). This is a HUGE step up from the customer support at the two other scheduling services we tried. Cons: I would just say that the setup process (particularly for multiple practitioners across several locations) takes a loooooong time. But I think it would with any software that has as many capabilities as this one. Once the setup is done, though, the hours it will save you in the future make it all worthwhile! Overall: Booksteam completely streamlined our old-school manual signup process and is light years ahead of the competition (SignUpGenius in particular). We are now able to have customers sort classes by location/practitioner/modality and class instructors are issued tablets to mark who attended (and didn't). This saves us SO many hours of work each week, it's great! Cons: There is nothing that I do not like about Booksteam. Booksteam is the best. Overall: This software saves so much time on so many things. I used to have to contact workers to see who would be available for a job. Then I would have to enter all of the client info into Quickbooks, import the Quickbooks info into my scheduling software. No MORE! On Booksteam staff can modify and set their own hours. Clients book them and the staff receives all the info they need for the job. My business can pretty much run itself now. I love this software. I have not found one like it yet. Pros: Easy to use. Makes it very easy to keep track of all our employees and their appointments. Overall: Their software is great! It's easy to use and has really helped us streamline our scheduling. And you cant beat their customer service. We accidentally erased one of our staff members and all her appointments. After sending a support request they got back to me almost immediately and were able to recover all the info we lost. Saved me a weeks worth of work tracking down all the appointments. I cant thank you guys enough!! Long live Booksteam!!!! Cons: For almost a year that im using this i never encountered problem in this software, its doing great so far. Comments: Great services, great software. Cons: I cant say any problem with this software, the interface is really simple and nice. Amazing and helpful! Pros: Absolutely the only way I will keep my appointments lined up! The best feature that I enjoy is selling my photography online. This has helped my company retain and grow tremendously throughout the last two years. Cons: When I first started using book steam I couldn't access it from my phone. As of now I am able to have everything from my desktop on my mobile devices through my business. Overall: Being able to manage my clientes, invoices as well as my favorite feature of selling my photography online. Cons: This software can also use in phone, im a bit irritated with application in phones. I cant use it, it has lot of bugs, its much better to use it on computer. Pros: I love how easy it it to set up and for my clients to use. Straightforward and simple. Really appreciate the MailChimp syncing, too for occasional newsletters. Cons: Wish there were more color theme options or patterns to spruce it up a little while remaining basic and simple to navigate. 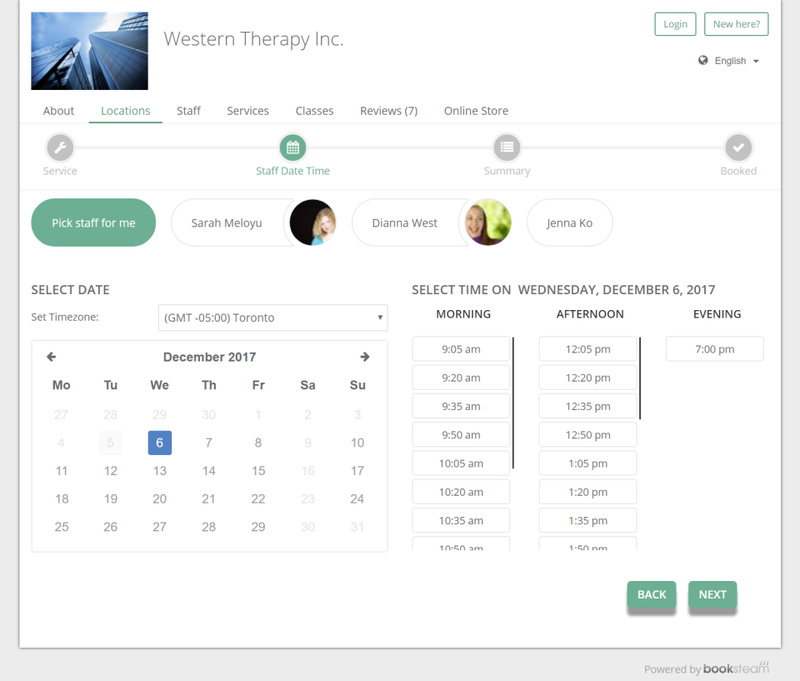 Overall: Clients can schedule online with ease. My tracking and scheduling becomes easily because book steam! Comments: We utilized the software with a company I worked with for my last 4 months with them. Pros: BookSteam is far more comprehensive and complex than its leading competitors and it offers this elevated level of service at a reasonable price. 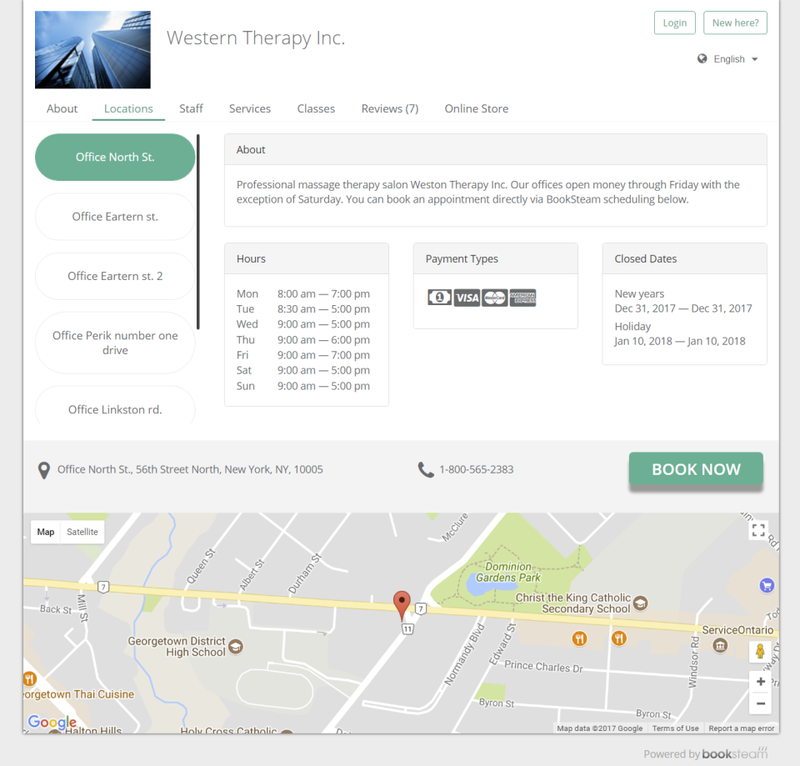 The client side scheduling tools were an unbelievably useful addition that we had not read about before utilizing the software, but came in handy all the same. Customer Support was on par with some of the best companies that I have ever worked with. Cons: It can be a little confusing to set up. Some of the terms that were used when we set it up were not something we typically use. Overall: We have been using Booksteam for several months and so far it has worked really well for us. We are not their typical customer as we have a small Staffing Company and we use it to the candidates can schedule interviews themselves with the time slots we have available. It makes it really easy and convenient for us. Overall: An excellent scheduling system with helpful guides and intuitive use backed up by fast, knowledgable and efficient customer support. Highly recommended. Cons: Patients are expressing difficulty accessing the system if they have forgotten their password. Even when they follow the instructions to obtaining their password, they are advised that their email address is already in the system. Overall: BookSteam has simplified the scheduling of appointments not just for me but for my patients. They appreciate the ease of using the app. No more playing telephone tag. Comments: We have been using booksteam for a while and it's the best appointment management software we have used thus far. Being able to get our clients to schedule their appointments online has transformed our business drastically. Here is how it works: Booksteam provides us free business scheduling page, we setup working hours, staff hours and our services. We place a 'booknow' button on our business website for our clients to click. Clients then redirect to the booksteam scheduling page, select our staff, services they wish to book and click confirm, that's it. Clients also receive reminders so they don't forget their appointment time, which is amazing! I also absolutely love how I can sync my calendar with my iPad calendar, whenever I get new appointments in booksteam it automatically shows up in my iPad. Cons: Please add mail chimp integration, that would be really convenient for me. Cons: I must say, so far the software has helped my clients organize appointments, but there is definitely room for improvement. Pros: Many features and produces thorough reporting to organize and streamline your business. When running into issues I have had a great experience with their customer support. Very timely and gets me the answers I need. 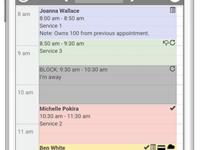 Scheduling and tracking appointments made easy. Cons: The start up process may take some time to learn. With so many feature it's understandable. Short term pain for long term gain which will save you many hours and keep you organized. Give it a try! 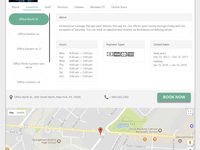 Pros: Many features that make booking process easier and faster such as multiple offices, paypal payments, services+classes, google calendar sync. SMS reminders and notifications are fast and reliable which are extremely helpful in minimizing noshows. Entire site is easy to navigate and operate. Cons: I would like to have my customers to be able to book multiple staff in one room instead of separate schedules. Recommendations to other buyers: If you're looking for a complete booking package, give booksteam a try and you will not regret it. They don't play tricks with you and you can try them free for a month. Comments: Books steam is awesome for appointment scheduling tool. Pros: I really in booksteam is ther is a auto online report that lets you track the attendance right away. Love it! Cons: If its your first time to use book steam its a bit tricky to set up but once you get hang of it, its not so bad. Comments: All in all still a great app. 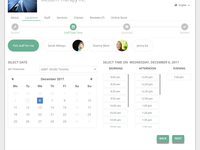 Pros: It is a awesome and adaptable appointment scheduling tool and it is a auto online report that can track attendance. Pros: Really easy to use, flexible and the support team are attentive and take feedback constructively to improve their product. Cons: Didn't like that you couldn't customize the colour scheme - but this has been recently added as a feature. Recommendations to other buyers: Give it a go. Booksteam won't let you down. Highly recommended. 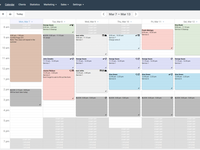 Pros: easy to set up and use, very flexible to arrange appointments on the calendar and do the re-schedule. Cons: reporting functionalities are limited. If Book Steam can develop more functionalities for reporting will be good, such as monitor clients whose credit in package are low and auto remider them to buy new packages, stc. Comments: We used to use another company before (don't want to name them but it starts with S...) and we were constantly dealing with issues and empty promises, it was very frustrating. Then we switched to a company offering free service (that was a huge mistake), a lot of time wasted once again. Finally we switched to booksteam over 6 months ago (from a friends tip) and it's been like a breath of fresh air (I hope I'm not going to jinx it now). Everything just works, I no longer have to email support every week (like I did with a previous company), now I spend more time actually doing my work. Support is also very friendly/helpful/quick whenever I need something. I really like the how simple and easy it is to use. Pros: I really like how simple and easy it is for someone to learn and use the software. I also found the customer support very helpful. Cons: I honestly have nothing but good things to say about this software. I have had nothing but good experiences while using this software. Comments: I used this company on and off for about 2 years now and received the best service from them. They're constantly adding new features / updates which makes my experience that much more pleasant. VERY helpful product for my business. Pros: I am a photographer and this app makes booking so much easier. I have only tested this app out and have not fully implemented it yet. But I want to start using it so I don't have to stay stuck to my phone in fear that I might miss a booking call. Cons: Most of my photography is for magazines so paying money for a booking app that will only be used wveyfew months do not work for me. This is best suited for wedding and portrait photographers. Late to know about it but... Seriously impressed! Pros: Very good customer support. Quite versatile solutions with plenty of options to select from. Very helpful reports. Beautiful User Interface. Cons: Somehow confusing at set up but that't not a big deal. Some minor issues but again not a deal breaker. Comments: As an Esthetician, I have found Booksteam to offer an extremely well priced book system. It's relatively easy to figure out although it might take a few tries to figure out the inner workings. It doesn't have everything that I was hoping for but it's absolutely adequate for business owners on a budget. Clients have sometimes complained about having to insert their credit card details everytime they book but, you can reassure them that their info is never saved and actually provides protection. I use Booksteam alongside Weebly. Comments: My business is no longer myself, it's grown, and between me and my 7 employees we schedule a ton of appointments and pen and paper just doesn't cut it. To make it even more complicated, we offer various group shops in multiple locations and the only software that has it all is book steam. It is honestly a huge time saver for us, around 70% of our clients book their services/group shops online and we have a TON of clients. I'm not sure what I would do without you guys! Keep it up! Comments: Could improve the app in mobile phones. Wish that the feature in Pc will be same in mobile phones. Cons: Sometimes it's buggy. Especially in mobile phones. I like this app! But its more convenient to use in Pc than in mobile phones. Comments: It was tough running small business and answering phone calls all the time, I could not concentrate on my work. After getting setup with BookSteam, my phone almost stopped ringing, I'm less irritated, more focused on work. Thanks. Comments: I can't say enough good things about booksteam, head and shoulders above the rest! If you want your business to improve and become less stressful (don't we all), you have to try this software. +++awesome looking design, supports multiple offices, mailchimp and paypal integration, google calendar sync, prepaid packages, loaded with a ton of features and has fast responding support team (what's not to love?). Comments: Good to go . Highly recommemded to everyone. Pros: The interface is very simple and easy to use. Booksteam is auto online report and best for appointment scheduling tool. Cons: Could improve the initial set up and the customer support. I didn't see any bad with it. Its still very useful for me. Pros: I had to test out a scheduling software for a client and this was by far one of the best on the market. I finished the setup and was able to get a testable demo ready for the client. You can even have it send your customers text messages. Cons: There is a bit of a learning curve at first, but it doesn't take long to take full advantage of the software. The customer service is also fantastic. I had no real big issues with using BookSteam. awesome software in many ways! Comments: Our studio in Hong Kong has been using booksteam for a while now and we have been satisfied. We tried many other companies before but half of them look very dated (design wise) and other half lack many features, glad we found booksteam! Very nice and friendly support team, anything I ask they reply instant and professional (and I ask a lot of questions ha). Loving it! Comments: I'm a photographer and sometimes I get real busy with the shoot, and it used to be huge inconvenience to deal with clients over the email or phone to schedule them in. Now with booksteam, most of my clients schedule their appointments online, and it freed up a lot of my time, so that's awesome. Pros: Good range of features and the ability to issue class packages for classes is great. The front end is responsive and simple yet good design. Cons: Unable to customsise email templates. I switched to booksteam from acuity because I wanted my clients to be able to book recurring appointments but most of my clients have complained that their recurring appointments don't usually work. one of the best if not the best! Comments: I don't regret going with Booksteam to manage our fitness center. When I'm away on trips around the country I always know what is happening with the business. Trainers and clients love the convenience of booking everything online. We could not imaging running our fitness centre without booksteam software.